In a bowl combine Parmesan cheese, bread crumbs and basil. In a separate bowl beat egg. Dip chicken in egg and then coat in the bread crumbs mixture. In a large skillet, brown chicken over meduim heat in butter and oil for 3-5 minutes on each side until the chicken is no longer pink inside and juices run clear. In a bowl blend garlic and oil. In another bowl combine Parmesan cheese, bread crumbs, basil and pepper. Dip chicken in oil mixture and then coat in the bread crumbs mixture. 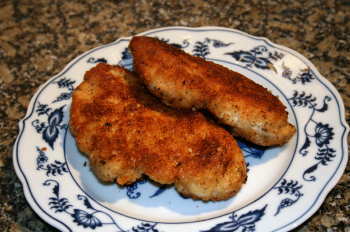 Place coated chicken breast in the prepared baking dish. Sprinkle the remaining bread crumbs on top. Bake 30 minutes or until the chicken is no longer pink inside and juices run clear.